When Karoline Cohn was born in Frankfurt on July 3, 1929, her parents Richard and Else had a necklace pendant made with the words “Mazal Tov” and her birthdate on one side, and the Hebrew letter Hey, a shortened version of God’s name, on the other. The pendant remained buried for more than 70 years under the ruins of a hut at the Sobibor death camp where women undressed and had their hair shaved before going to the gas chamber. It was discovered during archeological excavations at Sobibor in late 2016. A Yad Vashem database of Nazi deportation and transport lists, funded by the Claims Conference, enabled researchers to identify the owner of the pendant as Karoline Cohn. Because the pendant had the word “Frankfurt” under its date, researchers looked through the records of deportations from that city and found that the birthday on the pendant was that of Karoline Cohn from Frankfurt. View the record of the transport that took Karoline from her home in Frankfurt to the Minsk Ghetto. 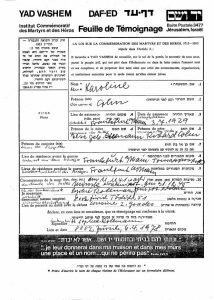 View the Page of Testimony submitted about Karoline to Yad Vashem. Karoline’s family was put on a transport to the Minsk Ghetto on November 11, 1941. The ghetto was liquidated in September, 1943 and its 2,000 remaining Jews were sent to Sobibor. It is not known whether Karoline survived the ghetto and dropped her pendant on her way to the gas chamber, or whether it was brought to the camp by someone else. This story has captured public interest largely because Karoline’s pendant is identical to one that belonged to Anne Frank, except for the date. Read about it in the New York Times. Yad Vashem has asked family members to come forward in hopes of discovering Karoline’s full story, and whether there was any connection between the two families. The Claims Conference also funded the filming of the Sobibor excavation, which in 2014 led to the discovery of the camp’s gas chambers. Instead of trying to contemplate the idea of six million victims, Karoline’s pendant reminds us that each victim was an individual, with his or her own story. The Claims Conference is proud to support a project that has brought us the memory of Karoline Cohn, a young girl who suffered an unimaginable death. When her loving parents had the pendant made for her, they never could have imagined the fate that awaited their daughter, but linking this find to the recorded information about its owner it has enabled us to remember Karoline’s name and preserve her story.